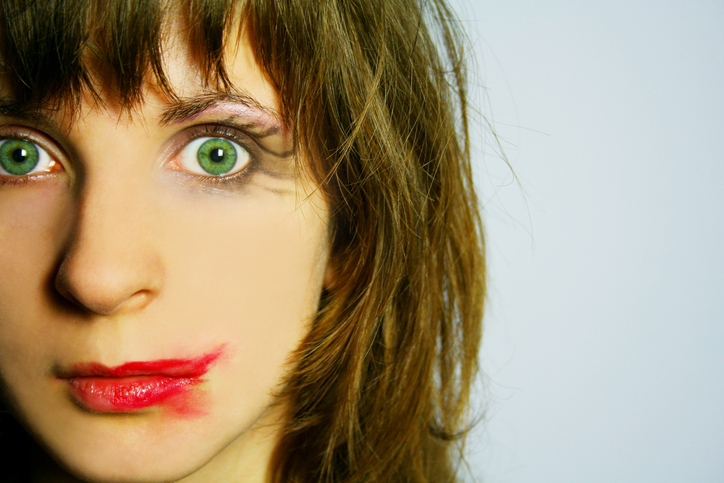 If you rub your face, your makeup might smear. To smear means ‘to spread an oily or wet substance on something,’ as we do with jam or butter on toast. Smear also means ‘to stain or spot with a wet or oily substance’ and ‘to blur by rubbing or by getting wet.’ Figuratively, to smear is ‘to ruin or try to ruin somebody’s reputation by spreading lies’ and, in US slang, it means ‘to defeat completely.’ As a noun, a smear is an oily substance or a stain or spot made with it. A smear is also the attempt to ruin somebody. Wendy smeared butter on her toast. Grease smeared on the mechanic's overalls. I tried to read the letter, but the rain had smeared the ink so badly that I couldn't make out the words. The candidate tried to smear her opponent. The children's sticky hands left smears of jam all over the furniture. The politician's smears worked; he won the election. A smear is also a small quantity of something spread thinly on a slide for microscopic examination, like a tissue sample. More specifically, a smear, smear test, or cervical smear, in UK English, or pap smear in US English, is a routine screening test for cervical cancer, where a small tissue sample is scraped from the cervix and spread on a slide that is then sent to the lab for examination. The related word schmear is of Yiddish origin and in informal contexts it is often used in the US to refer to cream cheese, which Americans love to eat with bagels. In this clip from the 2000s TV show The OC, one of the characters brings bagels to a family’s house and then is taught to schmear (ie, to smear cream cheese onto the bagel). Usually people use schmear as a noun (ie, “I brought bagels and schmear!”). Smear dates back to before the year 900, in the form of the Old English verb smirian, smerian, or smerwan, which meant ‘to rub with fat.’ It evolved into the Middle English verb smeren or smirien (to rub with fat or anoint). It can be traced all the way back to the Proto-Germanic verb smerwjan, and is related to the Dutch smeren, the German schmieren, and the Old Norse smyrja or smyrwa. The noun, meaning ‘mark or stain left by smearing,’ comes from the verb, and first appeared in the early 17th century. There was, however, an Old English noun, smeoru, that meant ‘fat,’ ‘grease’ or ‘ointment.’ This older noun became the Middle English smere and was sometimes also written smear before disappearing from English use. It can be traced back to the Proto-Indo-European root smeru- (grease), and is related to the Dutch smear, the German Schmer, the Yiddish schmir or schmmear, and the Old Norse smjǫr, all of which mean ‘grease,’ as well as to the Greek smýris (rubbing powder), and the Swedish smör (butter).